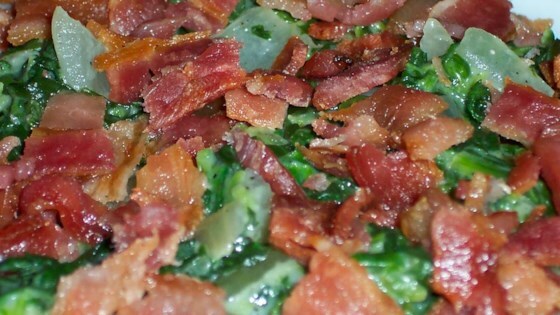 "Savory creamed spinach flavored with onions and bacon. My guests love this. It's not difficult but needs a couple of pans and constant stirring. We think it's worth the work!" Wrap bacon in a paper towel, and set on a plate. Cook the bacon in the microwave oven until crisp, about 1 minute per slice. Melt 1 tablespoon of butter in a large skillet over medium heat. Add the onion; cook and stir until transparent. Add the spinach and cook, stirring frequently, until most of the liquid has evaporated. In a separate skillet, melt the remaining butter over medium heat. Sprinkle the flour over the butter and whisk in using a fork until smooth. Season with garlic powder, salt and pepper; cook and stir until thick. Gradually stir in the milk so that no lumps form, and simmer until thickened. Add the spinach mixture to the cream sauce, and mix until coated. Crumble bacon over the top and serve. This has a wonderful flavor, however, it wasn't creamy enough for me. Next time I will double everything except the spinach. Still a great recipe! Thanks Lisa!